It already feels like a lifetime ago we took this trip. I wanted to share these photos sooner but had a big hold up getting my film developed. I had sent off my rolls on the 21st September and they only arrived at Carmencita Lab in Spain on the 3rd November, that’s 6 weeks! Not good from Royal mail! Finally getting the email saying they had arrived at the lab was the best feeling, as I really thought I wouldn’t see them again. Travelling to Barbados in September was a bit of a gamble as it falls in their rainy/monsoon season. But after doing some research and speaking to friends that had been at that time we decided to go for it. As our plane touched down we were greeted with some of the heaviest rain I have ever seen. It was so heavy that they didn’t let us off the plain until it calmed down. We looked at each other and hoped we hadn’t made a terrible mistake. Luckily throughout our trip we experienced a couple of days of rain but on the whole the weather was great. We were staying on the south coast near the village of Oistins. The island is much smaller than I had imaged. Measuring just 21 miles from north to south and 14 miles across. This made it fairly easy to get about and see a lot of the island's beautiful landscape. It's amazing just how different the coastline is on each side of the island. The south coast is dotted with smaller hotels and a lively strip of bars called St Lawrence gap. Then there is the more expensive west coast where the 5 star resorts line the pristine beaches and the celebrities hang out. Across the island on the east the coastline is rugged and baron. The water is too rough there to swim but great for surfing. Whilst we were there we had a mixture of chilling on the beaches as well as doing a few trips. Some highlights were snorkeling with the turtles, going down 150ft in a submarine, exploring Harrison's cave, St Nicholas Abbey and taking the Mount Gay Rum tour. The local people really are some of the friendliest we have ever come across. They were all so welcoming and made our stay really memorable. For anyone thinking about going I would highly recommend making the trip. You won't be disappointed. I knew for this trip I wanted to shoot mainly film. Having recently bought a Hasselblad 500cm it seemed to be the perfect time to get to grips shooting medium format.I also took along my trusty Leica M6 as well as my Xpro-1. My Fuji didn’t get a lot of use, as the light was so good I just wanted to shoot film. 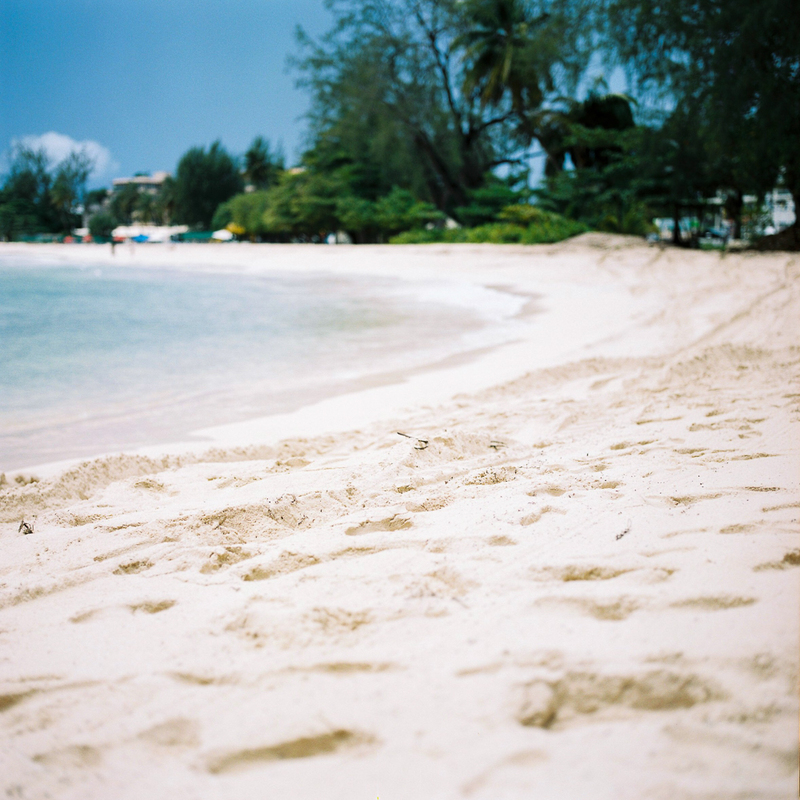 I had a few rolls of b&w Tri-x but I couldn’t bring myself to shoot them, as Barbados is a place, which needs to be captured in colour. All images below were either taken with the Hasselblad 500CM and the Carl Zeiss Planar CF 2.8/80 or with the Leica M6 and the Voiglander Nokton 1.5/50 VM on Kodak Portra 400, Fuji 400H & Cinestill 50. All images scanned and processed by Carmencita Lab in Spain.